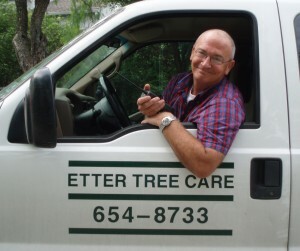 Etter Tree Care has proactively cared for trees in our community for over 40 years, enhancing the quality of life for this generation and for those to come. In addition to our services, we offer timely and expert information for everyone who cares for trees in our Resource section. You can use this contact form, email us at contact@ettertreecare.com, or give us a call at (210) 654-8733 to discuss how we can work together to care for your trees. 1International Society of Arborist Certified Arborists. Whether in the urban forest or in your backyard, ETC is a full service Tree Care company. Our International Society of Arboriculture certified and experienced arborists will work with you to make the best decisions for your treasures trees. ETC Representatives can provide information and tools to protect your trees from natural threats such as lightning and environmental stresses and help protect your trees during construction or other potentially damaging projects. From improving the health and beauty of your back yard trees to commercial land planning, Etter Tree Care consulting services include land development, tree selection, diagnosis and management of tree damage, disease and pests.